Sapiens reach the top as fast as human does. The only difference is it will stay here a long time. For as long as I can remember, no nonfiction book have received such fervor in such a short time. Acclaimed by Barack Obama, Bill Gates, and Mark Zuckerberg, Sapiens definitively deserves to be on your reading list. Foremost, I should mention history is not one of my subject of predilection, far from it. The result is Sapiens taught me so much. Unlike school, historian Yuval Noah Harari delivers an opinionated (but never provocative) story of our evolution through the Cognitive, Agricultural, and Scientific Revolutions. Whether we like it or not, the best books are always engaging work. What I like the most is that the author focuses on the Big Picture, asking the good questions, even if they are still unanswered. I assume his arguments could be debated, but the fact is the book help us reflect on our own role on Earth and this is for me the ultimate sign of success. We rediscover the motivation and the key role of things we accept as natural - cultures, empires, money, religion, language, writing. We realize the danger for humans to dominate and change the world at an ever-increasing rate. But Sapiens is not a fatalist publication. It presents the past in a new light, to let us envision a brighter future. I think everyone should read this book. Seriously. 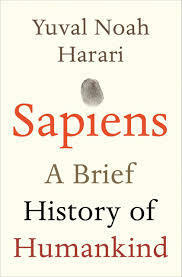 Yuval Noah Harari showed brilliantly to a wide audience that History is not just about relating facts. Very inspiring.